Laura & Matthew Spittle own and run Vermont Horse Country and High Brook Morgan Horses. 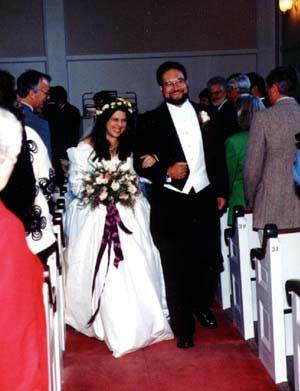 Laura used to be Laura Gordon before she and Matthew got married in October of 1997. She has operated the store since 1985. Matthew now has Vermont Horse Country Real Estate, works in the store, on the farm and picks up the pieces for Laura whenever she asks. All of which keeps him too busy to pursue a real job off the farm for which Laura is eternally grateful. She could never do this without him! With him it has become a wonderful adventure! High Brook exists because Laura's grandmother was a real Vermonter who made sure that a family farm stayed in the family. Laura's grandfather was a retailer in Boston for many years and apparently transmitted his retailing genes through Laura's mother. In addition, both Laura & Matthew have had a lifelong interest in horses which makes it all come together as they say. Laura & Matthew live on the family farm with 20+ Morgan Horses, a very soft dog named Willow and 2 insane Persian cross cats.